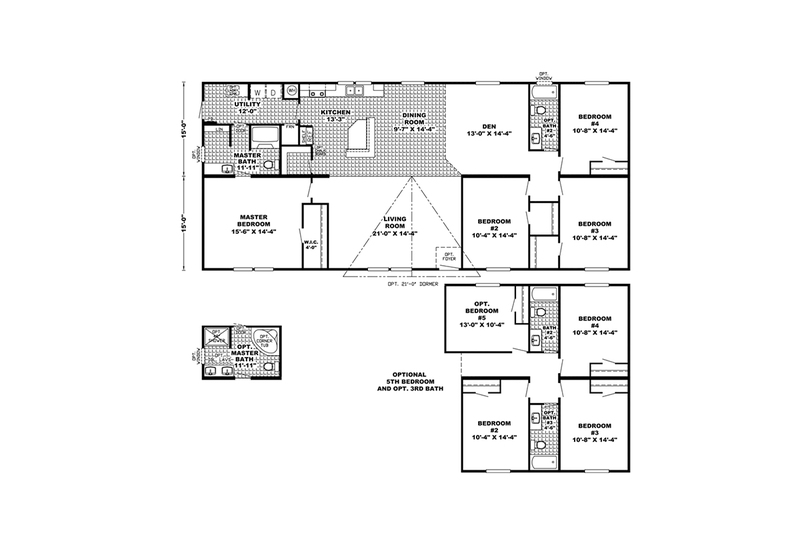 The Bartlett SIG28564A Well planned affordable midsize four bedroom home with large home features including spacious living room, open kitchen with convenient center island work station/ serving/snack bar, privately located master suite with glamour bath, large guest bedrooms, utility/laundry room, and extra storage capacity throughout this ideal family home. The Abdallah PRF28524A Skilfully designed value oriented family home with no wasted hallway space, large living room, extra large master bedroom privately located away from king size guest bedrooms with lots of closet space, bright modern center kitchen features convenient functional island work station with breakfast bar and adjoining family sized dining area. The Adams SIG28684A Beautifully crafted family oriented home features spacious living room, bright modern well equipped kitchen, adjoining den/family room, separate utility/ laundry room, large master bedroom suite with beautiful bath available with optional luxury bath, king size bedrooms and lots of closet space. The Hopkins SIG32603A Quality built affordable home features open concept with extra large living room open to beautiful kitchen with lots of handcrafted cabinets and an abundance of countertops, large bedrooms with lots of wall space for preferred furniture arrangements, walk-in closets in all three bedrooms and available optional luxury master bath. The Huntington SIG32684A Spacious family oriented customizable home with four bedrooms plus den or optional fifth bedroom, or as a three bedroom with three baths, expansive living room open to beautiful well appointed kitchen with extra large center island, family sized dining room and separate utility /laundry room with access from kitchen. 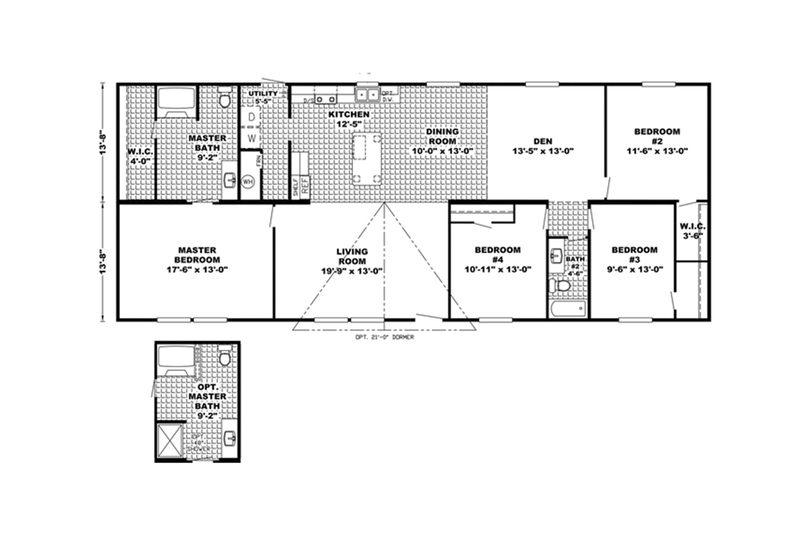 The Jefferson SIG16763A Homeowner preferred single section floor plan room arrangement with master bedroom and bath privately located away from guest bedrooms with large living room open to bright modern kitchen/dining at center of home, eliminating wasted hallway space. 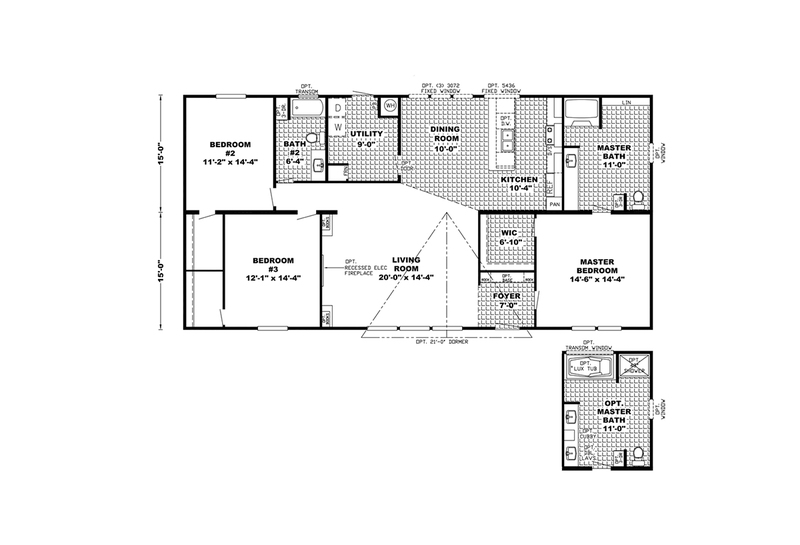 Optional glamour in-suite master bath with separate garden soaking tub and stall shower is recommended. 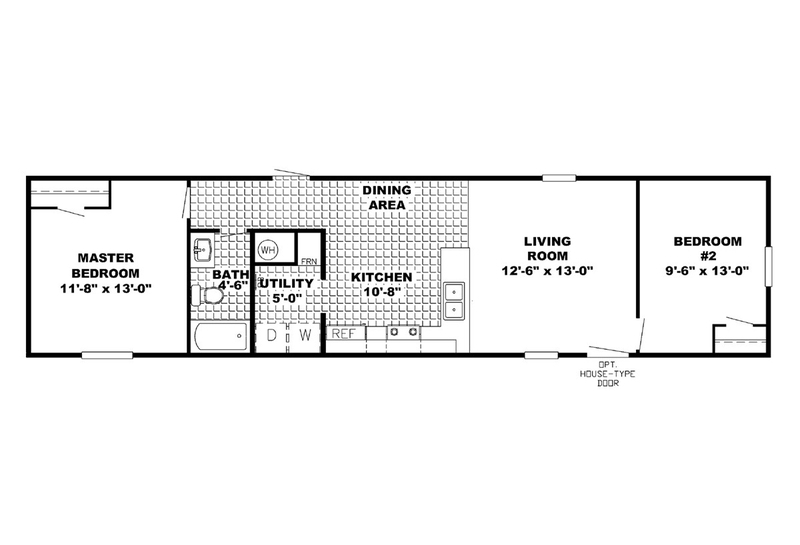 The Livingston SIG14562A Affordable single section two bedroom/two bath home features spacious living room, convenient center kitchen with lots of cabinets and countertop space. 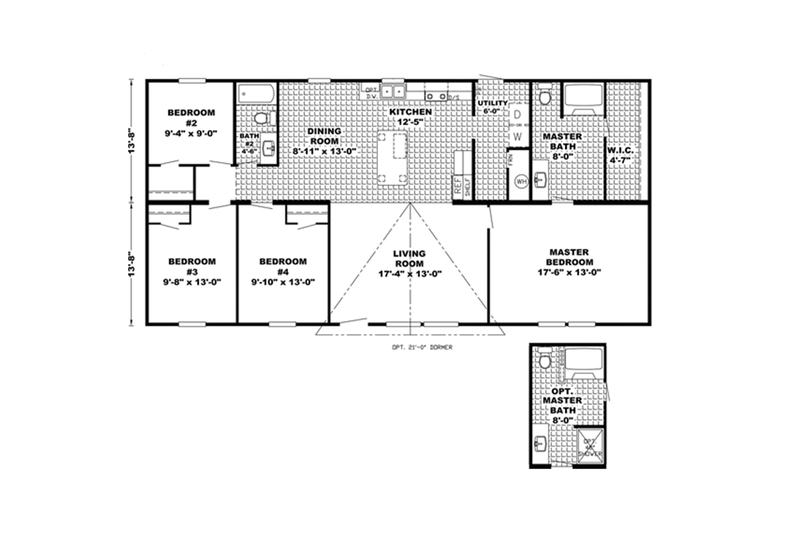 Both bedrooms will accommodate king size furniture arrangements. 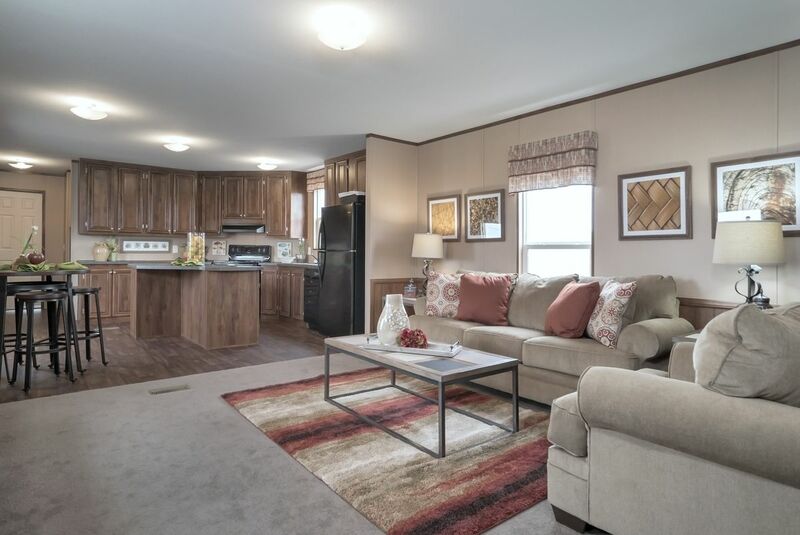 The Middleton SIG28563A Value priced quality home features spacious living room, modern open kitchen with center island, separate utility/laundry room, large master bedroom with in-suite bath and walk-in closets in all three king size bedrooms. 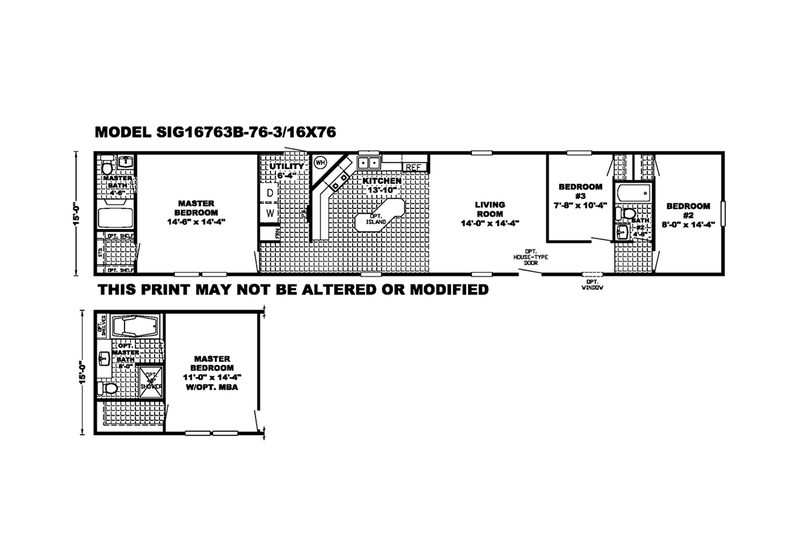 The Morris SIG28563B Flexibly designed three bedroom plus den, available optional fourth bedroom, spacious living room open to large island kitchen, family sized dining room, privately located master bedroom with walk-in closet, in suite bath and/or optional glamour bath with garden tub and stall shower. 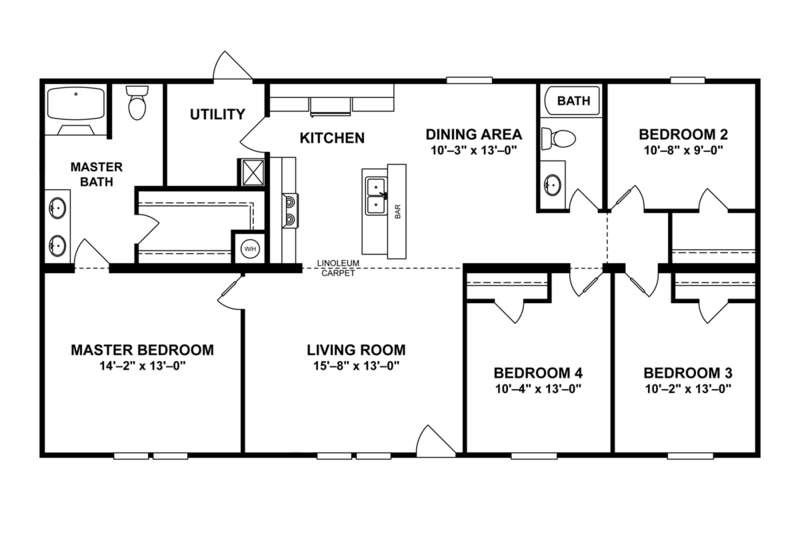 The Parkside SIG16763D Well built affordable family oriented single section home features distinctive foyer into spacious living room open to beautiful bright modern kitchen, three king size bedrooms with walk-in closets, master bath with available glamour bath option that includes large soaking tub, separate stall shower and dual sink vanities. 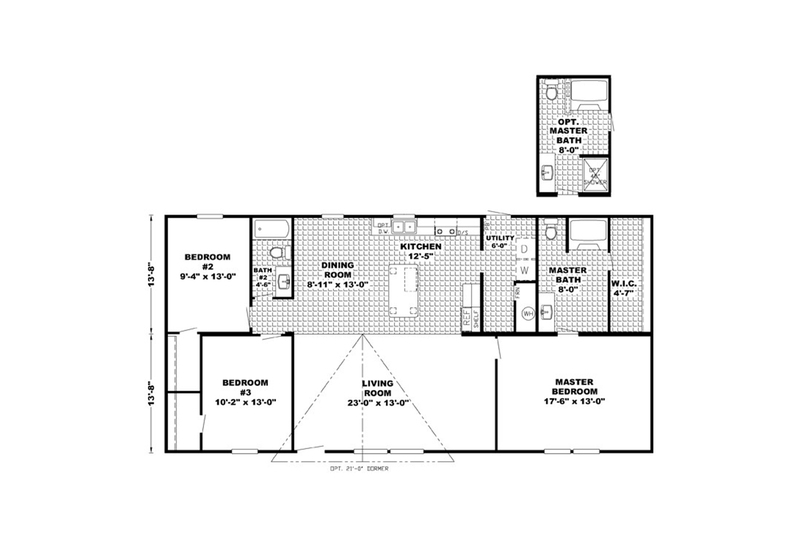 The Ross SIG16723A Homeowner preferred single section floor plan layout with master bedroom suite privately located away from guest bedrooms and second bath, large center living room and kitchen, eliminating wasteful hallway space. 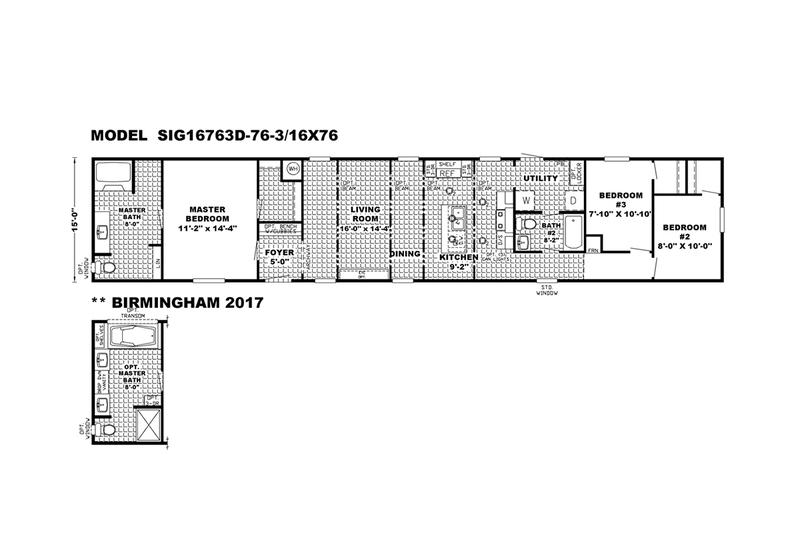 The Sherman SIG16763B Large living room and beautiful kitchen at center of this well planned floor plan with master bedroom and bath at opposite ends of home from guest bedrooms and second bath. 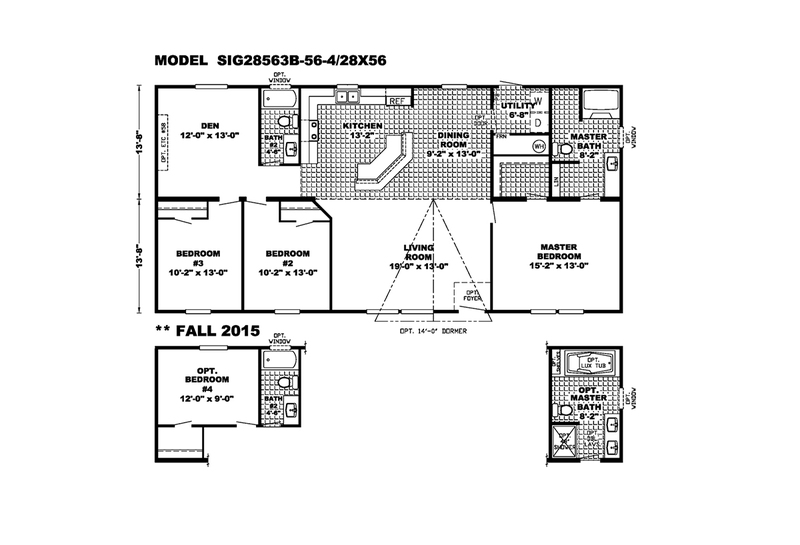 Available master bedroom suite upgrade recommended for this well planned home.